Jerez 1994 saw the sorry end to Eric Bernard's career, one of the many mercurial talents to pop up from the French Winfield racing school. As much as his contemporaries from French F3 and International F3000 (Jean Alesi, Erik Comas, 'Jules' Boullion, Olivier Panis - all Winfield and ORECA drivers at one time) he was regarded as the next Prost - in his home country at least. Together with Comas at DAMS in F3000 he formed by far the best team in the category, both sharing in the limelight with several wins, Comas winning the championship after Bernard had left for F1. Unlike Jean Alesi, who had wisely followed the English route into F1 with EJR and Tyrrell, Bernard and Comas both tried their first hand in F1 with French teams. They shone on occasion, Bernard particularly in his first full season with Larrousse and Comas outpacing Thierry Boutsen at Ligier in 1992. But the breakthrough never came. A big crash in practice for the 1991 Japanese GP meant Bernard was out of the running for an entire year. Healing went agonizingly slowly but thanks to long-time backer Elf he was picked up by Ligier as their 1993 test driver. Ironically, his former team mate Comas went the other way, signing for a Larrousse team that was gradually slipping to the back of the grid. The autumn of 1994 then proved disastrous for Bernard and Comas, Erik on his way out for Swiss rent-a-driver Délétraz and Eric becoming a victim of Flavio Briatore's power politics. 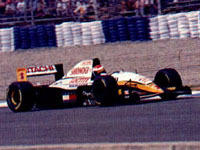 For Jerez, Bernard effectively swapped with Johnny Herbert but for the last two races of the season Lotus decided to give Mika Salo his first shot at F1 - which meant the end of the line for Bernard. Since their departure from F1, Eric and Erik have struggled to find their feet in GTs and sportscars. It is only now that their talent is shining through again, Bernard starring for Panoz and Chrysler in Europe and the USA, Comas winning for Nissan in the Japanese GT Championship.